Click Aquitaine, Charente or Lot on the map below for full information on cruising areas. Click on base names for detailed maps and cruising routes for cruiser boats and penichette barges. Culture and gastronomy abound in the sunny region of South West France. Aquitaine has ancient Bastide towns, medieval market squares and magnificent chateau in a picture postcard scenic landscape. River Lot offers cruising through wide valleys and steep gorges in a natural environment of plentiful wildlife. 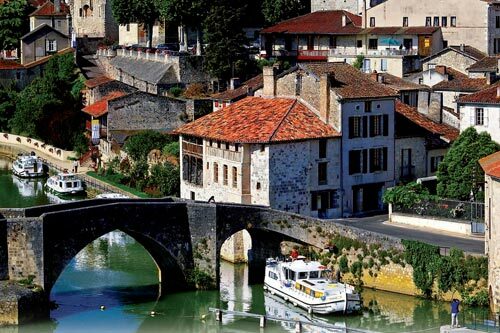 The unspoilt River Charente gives peaceful cruising in cognac country. Read our guides to Boating Holidays in Aquitaine, Boating Holidays in Lot and Boating Holidays in Charente. In Aquitaine our cruiser boat base at Castelsarrasin leads to the amazing boat lift at Montech and the fortified bastide town of Montauban. Scenic Agen and Negra lead to the Canal du Midi, or cruise the River Baise from Le Mas d'Agenais and stop at ancient villages with superb restaurants. On the River Lot our cruiser boat base at Douelle gives access to the scenic upper Lot, with limestone cliffs and cascading waterfalls. You can also hire a horse to take with you! The River Charente is a beautiful and quiet river. Our base at Jarnac is close to the Courvoisier distillery and visitor centre. Note that the locks on the Charente are manual!